We are Art Club, where all artists (both new and experienced) come together to meet and share ideas. Come and let your imagination express itself. We meet on Thursdays at lunch in room 208. This group is composed of Malvern students who serve as "Best Buddies" to those who face ability challenges. Through this program, participating Malvern students develop ability awareness training as well as leadership skills. The group goes on a field trip to Danforth Tech. every other month. We read great books and discuss them as an inclusive community. All are welcome to join! We meet on Friday once a month in room 206. Brick-by-Brick is a club focused on aiding our community and other places in need to help them flourish. Get involved in our fun events as a Malvern volunteer who helps make our school and planet a better place. We meet Thursdays at lunch in room 308. This dedicated group of students collaborate on the design and coding of autonomous robots for various competitions. 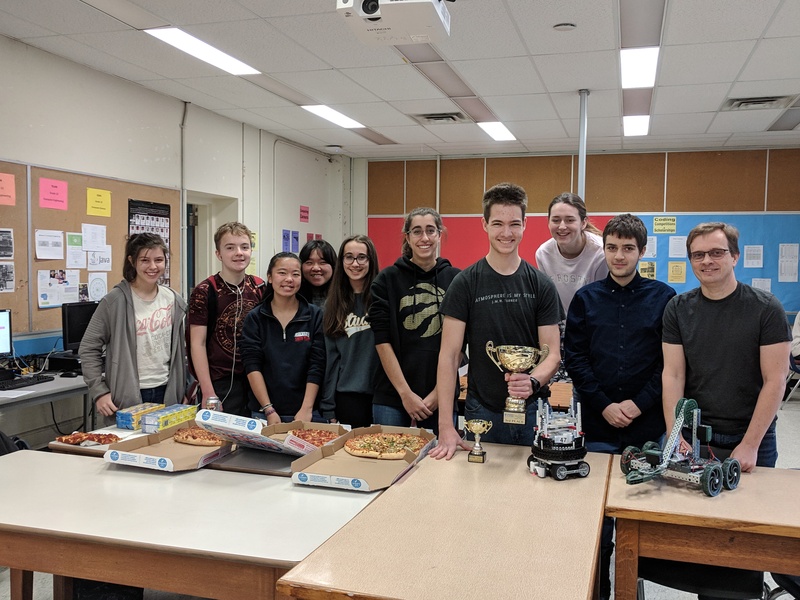 In the Fall of 2018 the team finished 3rd in a field of 59 teams at the annual University of Ontario Institute of Technology (UOIT) robotics event. In the Spring of 2019, the team is planning to compete in the international Robocup soccer event. Malvern's Concert Choir meets on Wednesdays at lunch in room 302. The debate team competes with schools from across Ontario on various current events. Join us to learn how to debate to and participate in our trips. We meet Tuesdays at lunch in room 209. This club screens a variety of films on social justice topics, such as 'shorts', 'director's commentaries' and music/concert docs. Come out, watch our films and learn about current issues using a variety of film mediums. We meet on the last Monday of each month in room 109. We meet Tuesdays and Fridays at lunch in the Fitness Room. Malvern's Jazz Choir meets in room 302 on Wednesdays after school. The club's purpose is to learn and share knitting skills as well as produce scarfs, socks, hats and other pieces of clothes to help people in need in the Toronto area keep warm during the winter months. We meet Wednesdays at lunch in room 310. MGSA is the sassiest club at Malvern! We plan fun events and challenge homophobia and gender-based discrimination, all while eating snacks at the same time. We meet Fridays at lunches in 202. This club features volunteer senior students who mentor and tutor junior students in math. The club also allows all volunteers and participants the opportunity to practice together in preparation for provincial math contests. We meet at lunch and acter school. Ask your math teacher for details. This club features volunteer senior students who mentor and tutor junior students in math. The club also allows all volunteers and participants the opportunity to practice together in preparation for provincial math contest. As part of the "SAC", Prom Committee designs and constructs our amazing annual prom! We are always looking for grade 12 students (through selection process) to help us in the planning. We meet Fridays at lunch in room 211. Reach for the Top is a team quiz program (like Jeopardy, but teams) where teams of 4 high school students compete against other teams of 4 on topics including history, science, math, english, philosophy, sports, movies, and current events. Competition is local, followed by regional, provincial and national. We meet Mondays in Room 304 at lunch. We are committed students who volunteer to help end the stigma around mental health by discussing it together in a friendly and welcoming space. We help to develop events to address common mental health issues that Malvernites face. We are open to all students! We meet Tuesdays at lunch in room 109. Support our Soldiers & Veterans is made up of students and teachers who support Canadian soldiers overseas and veterans who have come home. SOS Vets raises and spreads awareness about ongoing conflicts abroad and at home involving our soldiers and veterans, as well as issues such as homelessness and PTSD. We also fundraise and support local organisations who aid these causes. We meet Fridays at lunch in room 304. Wednesday's at lunch in Room 208. We meet Tuesdays and Thursdays after school. We are a group that aims to empower ourselves and each other, as well as those in our global community. We focus on planning fun events and raising awareness of issues of equality and the modern feminist movement. We're open to all students who self-identify as female. We meet on Wednesdays at lunch in room 305.